Each teacher’s manual consists of 13 lessons. A three-step lesson plan is used for the classroom setting that provides commentary and engages the learners through interactive teaching methods. Discussion questions from the student’s book are also included. Each book offers a user-friendly format with adequate space for writing. The student’s book contains factual, analytical, and thought-provoking inductive Bible study questions to get the learner into God’s Word. There are three parts to each lesson: Getting Started, Searching the Scriptures, and Making It Personal. It is a handy 15×23 cm size. The CD features ready-to-use or customizable PowerPoint slides for each lesson. It includes transparency art, flexible-use case studies and supplemental visuals and adaptable verse cards. This material was originally published in English by Regular Baptist Press. A survey of the Old Testament with particular attention to God’s revelation of Himself and His plan for redemption. The course will help learners understand God and relate to Him. 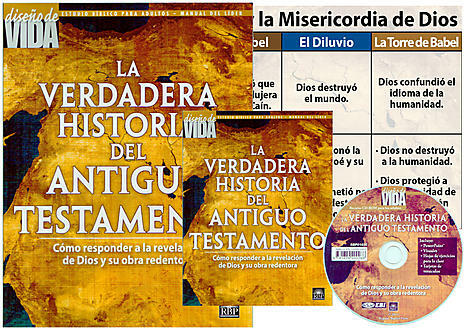 It develops the chronology of the Bible, from Matthew to Revelation. It focuses on the important themes of the incarnation and ministry of Jesus Christ, the birth and development of the church, and the necessity of living a righteous Christian life. This study of Genesis underscores the fact that God gave the human race privileges and responsibilities that it squandered. From the first test of love for Him in the Garden of Eden to the treatment Joseph received from his brothers, we can trace the failures of fallen human beings. But thankfully, we can also trace the events orchestrated by our sovereign God. Who is Jesus, and why is He worth trusting? Perhaps no other questions are more important than these. They are so vital, in fact, that the Apostle John wrote a book to answer them. Joshua, Moises’ successor, was ready to lead the Israelites into Canaan. He knew the challenge was huge, but he also knew that God’s sufficiency was unchallenged. What is Christ’s calling for you? In reality, the answer is quite simple. It has been the same since He left the earth: He wants believers to make disciples of all nations. Answer the call of Christ became the goal of all who followed Him. The book of Acts is a record of their work, as well as the Holy Spirit who empowered them.